We recommend checking out our discussion threads on the EAW UX3600 Digital Signal Processor, 3 Input x 6 2039199-00, which address similar problems with connecting and setting up System Processors EAW. The user manual for the EAW UX3600 Digital Signal Processor, 3 Input x 6 2039199-00 provides necessary instructions for the proper use of the product Pro Audio - Installation Sound - System Processors. 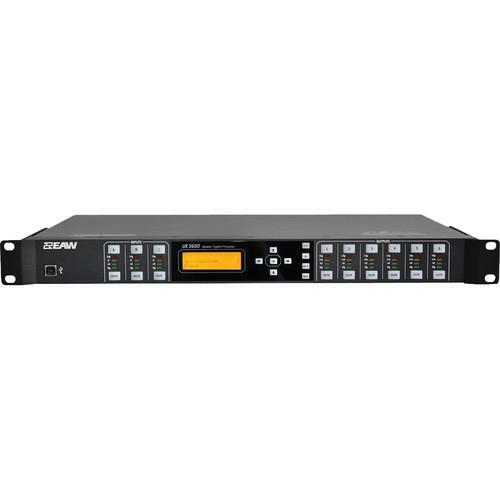 The EAW UX3600 Digital Signal Processor is a 1RU 19" rackmountable DSP processor designed for PA speaker management in touring, installed, and live sound applications. The unit features three analog inputs and six analog outputs over balanced XLR connectors and provides custom designed algorithms for setting EQ filters, delays, gain levels, polarity and crossovers. The signal processing design provides extensive user control and takes into account factors such as room temperature when calculating delay times and humidity when equalizing for air loss to accommodate for the way that the speed of sound changes under different environmental conditions. For Presets, the processor also implements EAW's Greybox settings including the EAW Focusing algorithms designed by David Gunness to correct for anomalies in the speaker drivers and box designs of many EAW loudspeakers. Integrated limiting ensures maximum loudness without clipping the system's outputs and 50 lockable user presets can be stored to the unit's non-volatile internal memory. The processor can be controlled using the front panel user interface or with a computer via USB using the EAW Pilot Software. Front panel LED metering provides visual feedback and push buttons allow for each channel to individually selected or muted. If you own a EAW system processors and have a user manual in electronic form, you can upload it to this website using the link on the right side of the screen. Box Dimensions (LxWxH) 20.3 x 15.7 x 5.4"
The user manual for the EAW UX3600 Digital Signal Processor, 3 Input x 6 2039199-00 can be downloaded in .pdf format if it did not come with your new system processors, although the seller is required to supply one. It is also quite common that customers throw out the user manual with the box, or put the CD away somewhere and then can’t find it. That’s why we and other EAW users keep a unique electronic library for EAW system processorss, where you can use our link to download the user manual for the EAW UX3600 Digital Signal Processor, 3 Input x 6 2039199-00. The user manual lists all of the functions of the EAW UX3600 Digital Signal Processor, 3 Input x 6 2039199-00, all the basic and advanced features and tells you how to use the system processors. The manual also provides troubleshooting for common problems. Even greater detail is provided by the service manual, which is not typically shipped with the product, but which can often be downloaded from EAW service. If you want to help expand our database, you can upload a link to this website to download a user manual or service manual, ideally in .pdf format. These pages are created by you – users of the EAW UX3600 Digital Signal Processor, 3 Input x 6 2039199-00. User manuals are also available on the EAW website under Pro Audio - Installation Sound - System Processors.